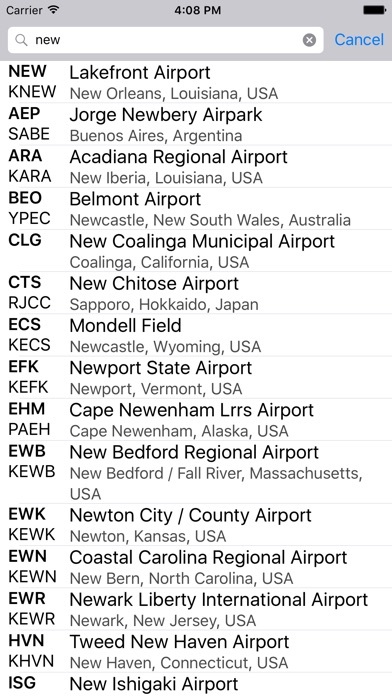 This app shows the 3- and 4-letter airport codes as well as the common name for the airport. No internet connection is needed, so as I'm flying along looking at the airport codes on my cockpit display, I can quickly pull up the name using this app. Works great! I'd love to be able to mark an airport as a Favorite and then input some personal notes about it. I'm running iOS 7.1.2 on an iPhone 4S. I'm an airline pilot flying across the country and often wonder what airports are showing (the four letter codes) on my primary flight display. This app requires no internet connection and quickly shows the full name and city for the airport code. Exactly what I was looking for. I am an intl. inspector and this is a handy tool to have. This app has many of the common airports but almost none of the small general aviation airports. I would have gotten 4-5 stars if it had those. 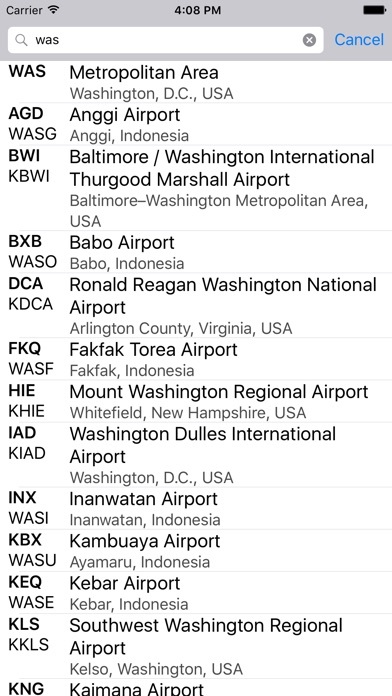 The app runs great but many airports are missing, including airports with all letters in their identifiers. Nice simple way to find any airport code. Search UI is very responsive and nice that it works when no wifi is available. Good for world travel, so-so for GA use. This has airports that are pretty remote but it doesn't seem to have the 'State' airports that are designated by alphanumeric codes (I.e. S59). It does seem pretty good for traveling to airports served by commercial carriers. It's worth it! This app has impressed me. It picked up any small airport in bush Alaska. Try ATT.